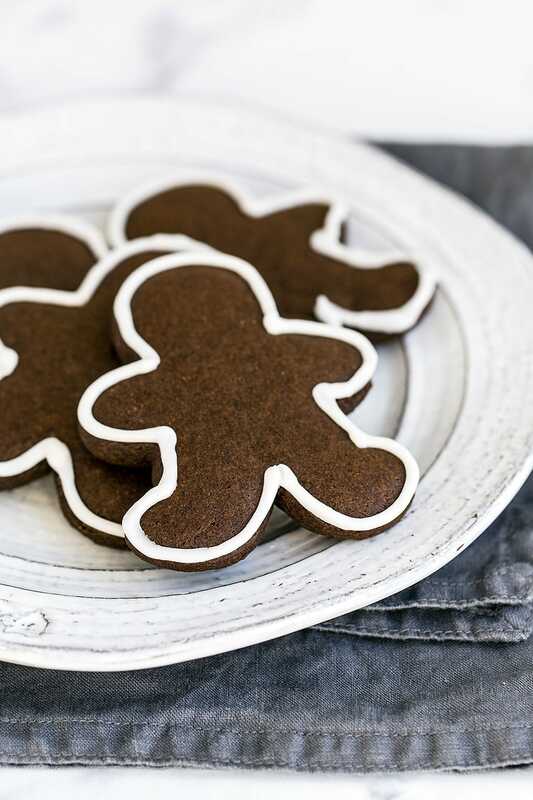 Easy Gingerbread Cookies are thick, soft, and perfectly maintain their adorable shape. This dough is a dream to work with and the cookies can be made ahead of time! Easy cookie icing included. Click here to download our 10 Favorite Christmas Cookies! Taste: The perfect balance of sweetness and spice that’s quintessential to this time of year! Texture: These bake up soft and a little chewy with slightly crisp edges. Ease: Very easy! You can make the cookies ahead of time and freeze them, too. Pros: An essential recipe to add to your Christmas cookie repertoire. Would I make this again? Every year. Nothing says Merry Christmas quite like a batch of homemade Gingerbread Cookies baking away in the oven. The aroma alone is the epitome of festive! But the process of rolling the dough, cutting out shapes, then decorating the baked cookies is a tradition I look forward to every year. Can you imagine?! I wonder if that giant cookie was even edible? Whatever size you make your gingerbread cookies, I hope you enjoy the process every step of the way. Can I substitute the molasses? Be sure to use unsulphured molasses in this recipe, not blackstrap which is very potent. I’ve received a few comments from readers who live somewhere molasses isn’t available. 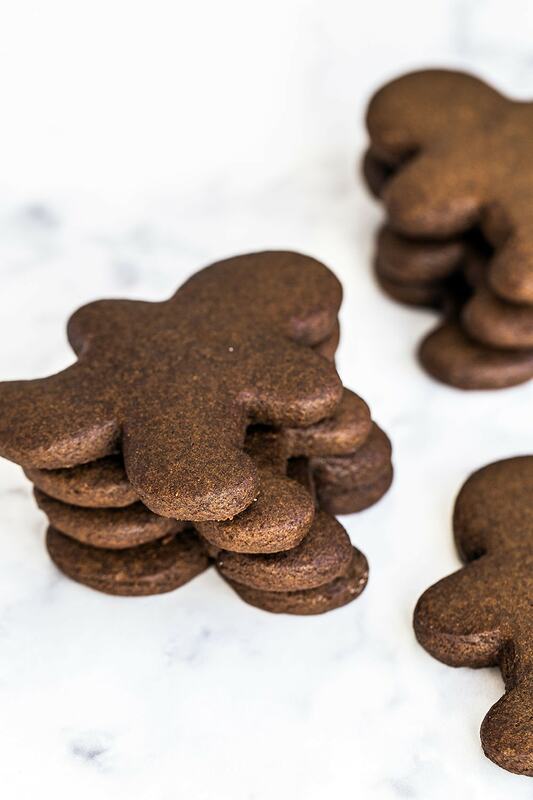 Molasses is a critical component of this gingerbread cookie recipe. So unfortunately substituting it with something different will affect the final taste, texture, and color of these cookies. If you live in the U.K., you can use treacle in place of the molasses. It’s basically the British equivalent. If you can’t find molasses or treacle, use maple syrup, dark corn syrup, or honey in its place. You may want to increase the spices in the recipe if you’re using a substitute to make up for that lost molasses flavor. To make things quicker, easier, and cleaner, I like to roll the dough out between two sheets of parchment paper or plastic wrap. Be sure to keep the dough moving in quarter turns and push the rolling pin from the center out so you roll it into an even thickness. As you cut out the gingerbread men shapes, you may find the dough has become too warm and soft. If this happens, just take the entire sheet of dough and pop it in the freezer or fridge until it’s solid again. 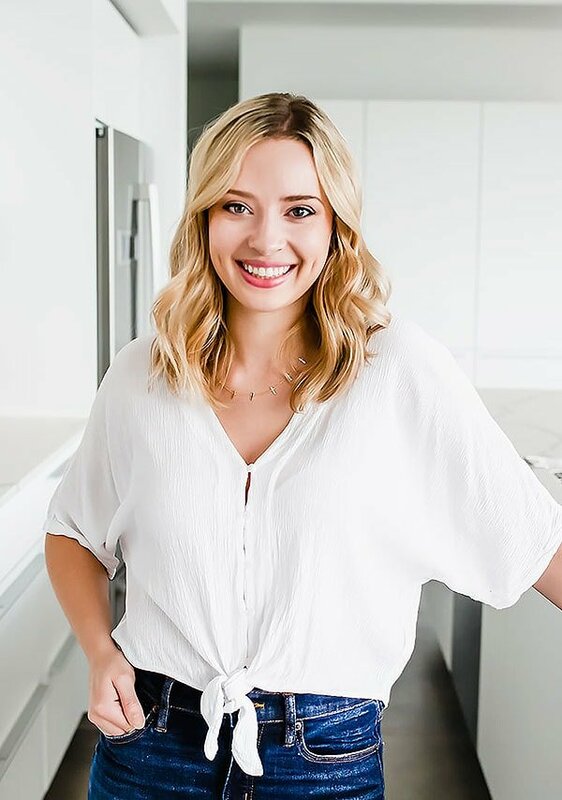 If the cookie dough is super warm when it enters the oven they may not keep their shape as well, so you can again pop the tray in the fridge for a few minutes to firm up the dough. 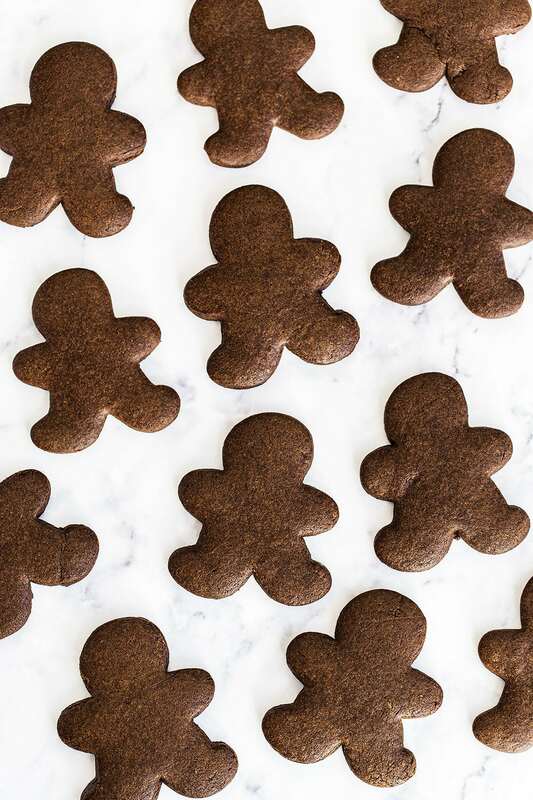 This recipe should yield gingerbread cookies that keep their shape but stay soft after baking. The ensure this, avoid overworking the dough. It’s not bread dough, so definitely don’t knead it. Use a gentle hand! Also, be sure not to over bake these. 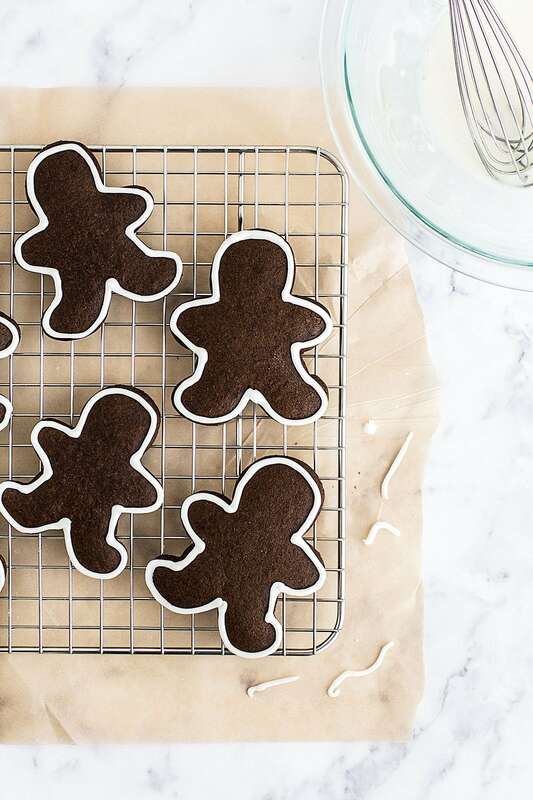 You’ll need to adjust the baking time depending on the size of gingerbread men cookie cutters you use. The smaller the size, the less time they’ll need in the oven. Take the cookies out just before they look completely done, they’ll continue to cook on the pan from the residual heat of the oven. I’m not a fan of royal icing, so I just included a very simple cookie icing in this recipe. You can learn more about my cheat for easy cookie icing here. I find the simplest way to decorate these cookies is by making borders with the icing. You can also add buttons or a face with the icing! A squeeze bottle is the best way to make quick and easy work of icing all of the cookies. Plus even the kids can get involved with squeeze bottles! You can make and refrigerate the dough for up to 2 days. Just make sure it’s in an airtight container so it won’t dry out. The spiced flavor will actually intensify in the fridge, kind of like marinating a steak! 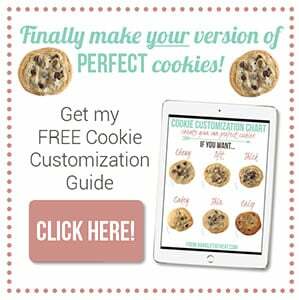 The baked but un-iced cookies can actually be stored in the freezer for a couple months! Simple pop a tray of cookies in the freezer until they’re solid then remove them to an airtight container. Allow to defrost at room temperature. If you’d like, you can refresh them in a 325°F oven for a few minutes. Be sure to check out my Christmas Headquarters page for more baking recipes, tips, and inspiration! 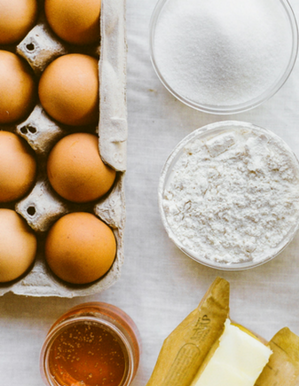 In a medium bowl, whisk together the flour, baking powder, baking soda, salt, ginger, cinnamon, cloves, and nutmeg to combine. In a large bowl, use an electric mixer to beat the butter and brown sugar on medium-high speed until well combined and smooth, 1 to 2 minutes. Add the egg and molasses and beat until combined. On low speed slowly add the flour mixture and beat until incorporated. Shape the dough into a thick disk and wrap in plastic. Refrigerate until chilled, about 2 hours or up to 2 days. Preheat the oven to 350°F. Line large baking sheets with parchment paper or silicone baking mats. Remove the dough from refrigerator and let stand until just warm enough to roll with ease. Place the chilled dough in between two large pieces of parchment paper or plastic wrap on a work surface. Roll the dough to a 1/4-inch thickness. 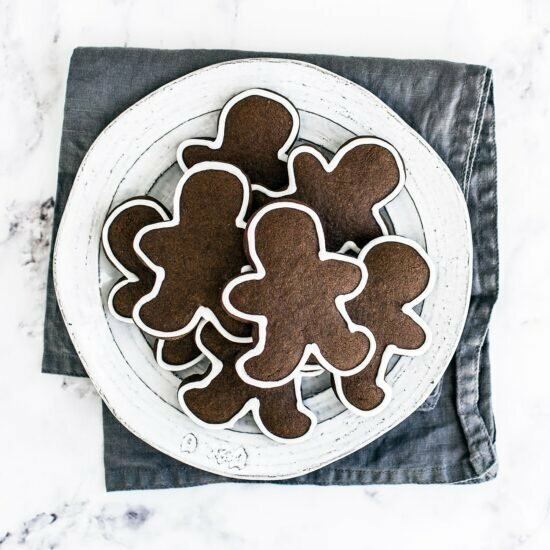 Use a gingerbread man cookie cutter to cut out shapes from the dough and place on prepared baking sheets, spreading at least a 1/2-inch apart. Reroll remaining scraps of dough into 1/4-inch thickness and cut out more shapes. If at any point the dough becomes too warm to hold its shape, return to the fridge (or freezer) until firm again. Bake for 10 to 12 minutes, or until the cookies are set and begin to brown slightly at the edges, rotating sheets halfway through. Let the cookies cool on the pans for 3 minutes then remove to wire racks to cool completely. In a medium bowl, whisk together the ingredients until a thick and smooth icing forms. Add more milk if the icing is too thick, or more sugar if it’s too thin. Transfer the icing to a piping bag, ziptop bag with a small hole cut in the corner, or to a squeeze bottle. Decorate the cookies with the icing. Allow to set before serving or storing. I’m curious to know…you used light brown sugar instead of dark brown, & then you added in molasses? Isn’t it possible to eliminate the molasses by switching to use the dark brown sugar instead of the light one? The dark brown sugar already has molasses added to it…doesn’t it?? Thank you Tessa! I need to know before I screw anything up! LOL! 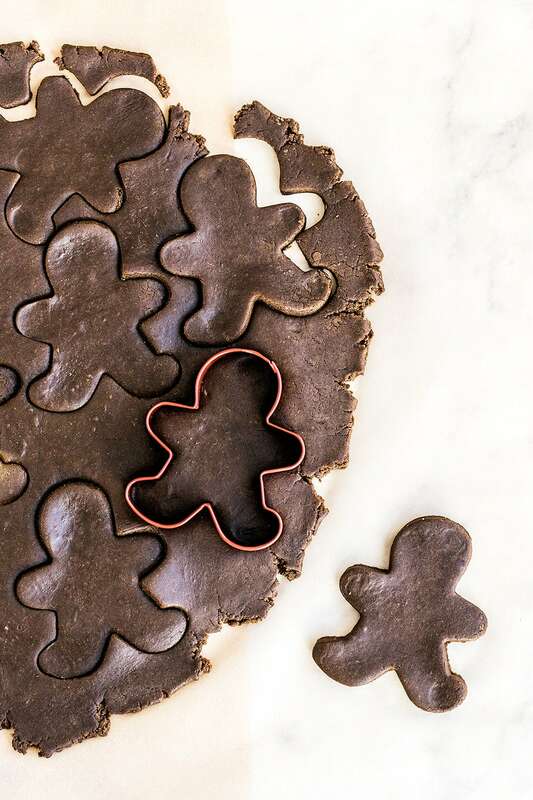 I would stamp out the shapes with the cookie cutter, but not remove the shaped dough to the baking pan yet. Instead, transfer the stamped out sheet of dough to the fridge or freezer and allow to firm before removing the shapes. This should help prevent breakage. Use your finger to hold down the hat part of the dough as you pull away the cookie cutter too. Hope that helps! 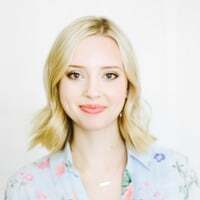 Hi Tessa, I’m not sure I can find molasses in my country. Do you think it could be replaced with another ingredient? Thanks in advance! Ps. I love your work! Is there any alternative for molasses? i like this recipe thank you. Are unsulfured molasses the same as fancy molasses which I can get here in Canada? Hi, I made the cookies and the flavor is great and texture soft, but I was wondering how yours are so dark? Mine were the lighter brown color. I have been baking and cooking my whole life. this is the first time I made gingerbread cookies, this was so easy. Thank you so much.